Instead of buying new blankets and sweaters, why not pick out a great outfit for your windows? We’ve all been there. It’s the first REALLY cold week of the year and you’re bundled up under three wool blankets drinking a steady stream of hot chocolate (spiked, of course) just hoping it warms up your insides enough that you won’t have to turn your heat on for the first time of the season. Well, I’m about to give you the best reason ever to head out and do a little home shopping because who wouldn’t want to save money on their energy bill while adding beauty to their home at the same time?! I DO!! Instead of buying new blankets and sweaters, why not pick out a great outfit for your windows? 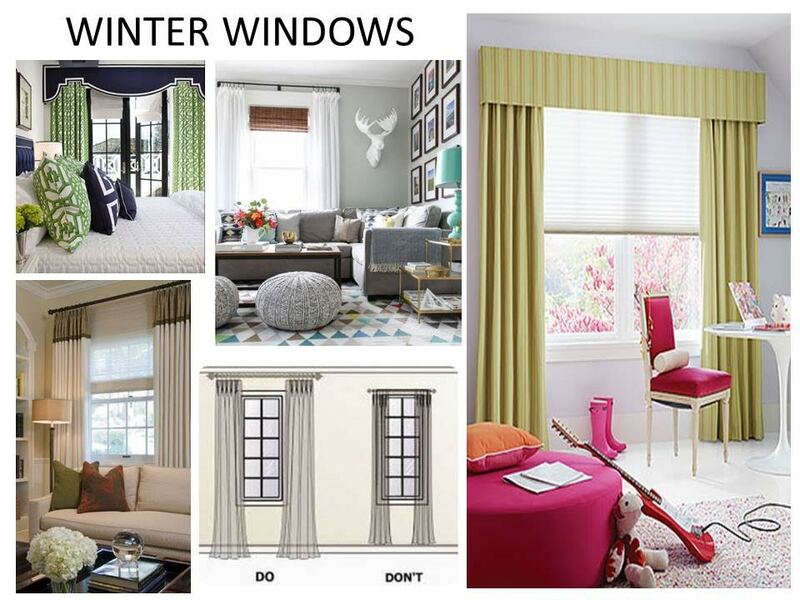 Your windows have a huge part in making your home warm and cozy during the next few months. Your first step in getting ready for the cold weather is to block those pesky cold air drafts that start seeping in from windows and doors. Layer, layer, layer……. It’s all about the LAYERS when it comes to a beautiful and functioning window treatment. It doesn’t matter what type of style you like, window treatments are often overlooked because of cost, design and efficiency. I believe that efficient window treatments consist of fabric shades, panels and lined woven shades. Window blinds (vertical or horizontal slats) are more effective at reducing summer heat from beaming sunrays than winter heat loss. Inside mounted window shades or roller shades add so much depth to the look of a window and act as both insulation and an air barrier. Installing drapery panels as close to the window as possible with returns is the most efficient design when dressing a window. Draperies drawn during cold weather can reduce heat loss from a warm room from 10-25%, adding to a room’s comfort. Therefore, during the winter months, you should get in the habit of closing all drapes at night. Whether you’re installing window treatments to enhance the look of your home or to make your home more energy efficient, it’s a win-win scenario. You can enjoy to finished look that new window treatments give your room, all while staying warm during these upcoming winter months. I guarantee you’ll still want the cup of hot cocoa, though!